Raccoons are usually grey-brown or orange-brown above, with a black or grayish color on their undersides. They are often referred to as “clever bandits” because of the characteristic black mask covering their face. Raccoons also have dexterous hands that they can use to open doors and trashcan lids, an ability that has sometimes landed them the title of "neighborhood pest." Their bushy tail, ranging in length from 8 to 16 inches, has 4 to 6 alternating black or grayish-brown rings. Mature adults are between 25 and 40 inches in length and weigh 10 to 45 pounds. Raccoon populations are found throughout southern Canada and most of the United States, except areas in the Rocky Mountains, Nevada, Utah and Arizona. They were also introduced to parts of Europe and Asia. Raccoons are common throughout New Hampshire, residing in both rural and urban settings. 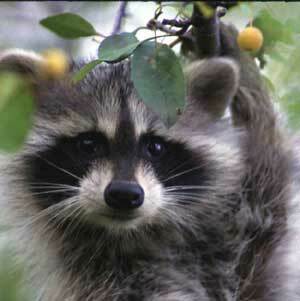 Common raccoons have extremely nimble fingers and thumbs, almost as skilled as a monkey’s. Because of this, raccoons can turn doorknobs, open refrigerators and lift trashcan lids. The term raccoon originated from the Algonquin word aroughcoune, meaning “he scratches with his hands.” During the 1700s, the "a" of aroughcoune was dropped to form the present day pronunciation of "raccoon." Raccoon populations are found in a variety of habitats, from woods to wetlands and rural to urban environments. They are commonly found along wooded streams. Common raccoons are omnivorous animals, eating grapes, nuts, berries, grubs, grasshoppers, crickets, voles, deer mice, squirrels and other small mammals. Raccoons will often “wash” their food if in close proximity to water; their species name lotor means “washer.” However, raccoons are not really washing their food, but are kneading and tearing it to get rid of inedible matter. They are very good swimmers and climbers and use both methods to obtain additional food. Raccoons often swim in small streams looking for aquatic food sources, such as crayfish, frogs, worms, fish, clams and turtles. They also eat acorns; the ability to turn their hind feet 180 degrees enables them to descend trees of any size both backward or forward. Raccoons are not hibernators, but may appear so during extremely cold weather. Individuals can sleep for up to a month, but they do not lower body temperatures or heart rates as dramatically as other hibernating mammals. They are active during warm winter weather and occasionally forage. However, raccoons do not have to eat during the winter, because they store approximately one-third of their body weight as fat, enabling them to survive without food for long periods of time. The majority of the year, raccoons are sedentary. However, during mating seasons, males will travel several miles in search of females. Mating season takes place from January to March in New Hampshire and, after a gestation period of approximately 60 days, a litter of 1 to 8 young is born in April or May. Newborn raccoons weigh about 2 ounces (60 grams), and it takes 3 weeks for their eyes to open. After 7 to 8 weeks, young are climbing throughout the den and, by the end of August, the litter is weaned and the young raccoons are independent. Common raccoons use many different types of vocalizations, including purrs, whimpers, snarls, growls, hisses, screams, and whinnies. When two raccoons meet on overlapping territories, they will growl, lower their heads and ears and show their teeth. The fur on the back of their neck stands straight in alarm. Despite this tension between the raccoons, most of the encounters end without a fight. Raccoons have designated hunting and trapping seasons for their fur in New Hampshire. Typical seasons run from September to March, and hunting can be done at night, unlike most other small furbearers and larger mammals. Please check the NH Hunting Digest for updated season dates, or get information about small game hunting in New Hampshire. Common raccoon predators include foxes, fishers and bobcats, but the majority of raccoon deaths occur from automobile collisions, disease or accidents. Raccoons sometimes enter buildings to give birth to their young in April. They often select a house with a fireplace and chimney to give birth. Homeowners should have a secure cap on each chimney to keep would-be raccoon mothers out. Common raccoons are a major carrier of rabies in the US; about 50% of all reported cases involve infected raccoons. Rabies is a serious viral disease that results in death if it goes untreated. Infected animals can be agitated and aggressive or fearless and lethargic. 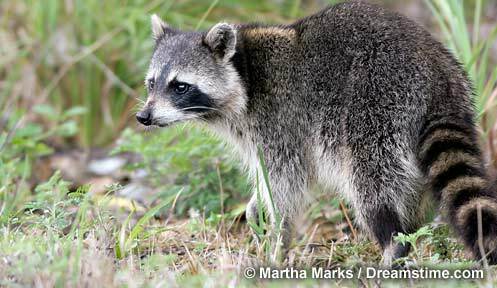 A sign of a possible infection may be a nocturnal animal, such as the common raccoon, wandering fearlessly in the daytime. If bitten by a possibly rabid animal, seek medical assistance immediately, since there is no cure once symptoms arise. To report suspicious animal behavior, contact NH Fish and Game’s Wildlife Division at (603) 271-2461. Written by Kat Bagley, Public Affairs Intern, New Hampshire Fish and Game Department.